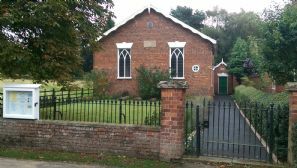 Welcome to Old Bolingbroke Methodist Chapel. Nestling at the foot of the Lincolnshire Wolds and the historical birth place of Henry of Bolingbroke, later King Henry IV. Old Bolingbroke Methodist Chapel became an Eco-congregation in July 2007. The Chapel received the award for undertaking an environmental audit of all its activities and for its commitment to ‘green’ activities in recognition of its stewardship of God’s creation. Our Chapel shows the work of God in the local area by being open for worship nearly every Sunday for morning service. Coffee mornings are held on the 2nd and 4th Thursdays in each month in the Chapel Schoolroom from 10.30-1200. This provides an opportunity to meet other villagers for a chat over a cup of coffee. Fairtrade, of course. From Horncastle turn left at the War Memorial, follow the road round to a sharp left bend and turn right into Chapel Lane. From Spilsby turn left at the bottom of the hill into Chapel Lane and look out for the red telephone box and post box. The chapel is next to the Chapel field.